Recycling Works: Where Did the Recycling Symbol Come From? 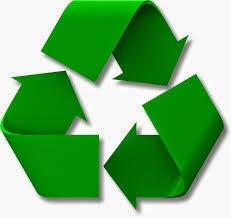 "The original recycling symbol was designed in 1970 by Gary Anderson, a senior at the University of Southern California at Los Angeles. It was submitted to the International Design Conference as part of the nationwide contest." What Does the Recycling Symbol Represent? The 3 arrows have twists and turns, in itself, and all three arrows chase each other. "Each of the three arrows can represent one step in a three-step process that forms a closed loop, called the recycling loop. The first step represents collection of materials to be recycled. This step takes place when recyclable materials are placed into your curbside recycling bin or taken to a local collection center. The collected materials are then cleaned and sorted for sale to a manufacturing facility. The manufacturing process is the second arrow in the recycling symbol. The recyclable materials are manufactured into new products for retail or commercial sale. The third step is the actual purchase and use of the products made from the recycled materials. The loop is now complete." Apart from recycling; here in this article, we should learn the basic facts about recycling symbol. Definitely question arises, that from where the recycling symbol come from. And definitely, we can get the answer from here in this above article; here the history of the recycling symbol describes how and when recycling symbol was introduced.